A village boy becomes a man by catching a tuna, in a revival of ancient tradition in ”The Test”, directed by Adilah Dolaiano. A French-Solomon co-production between Sukwadi Media and Compagnie des Taxi Brousse/French Televisions with funding support from CBA Worldview, the French version of the film premiered on France O. A man finds peace where he least expects it, in Broken Wind Chime, a short fiction film, directed by Regina Lepping. 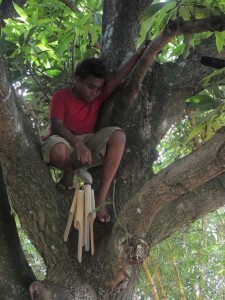 A youth film shot in the aftermath of the April 2014 floods in the Solomon Islands.